When it comes to teaching our children about life, there’s much that can be learned from the saddle of a bicycle. 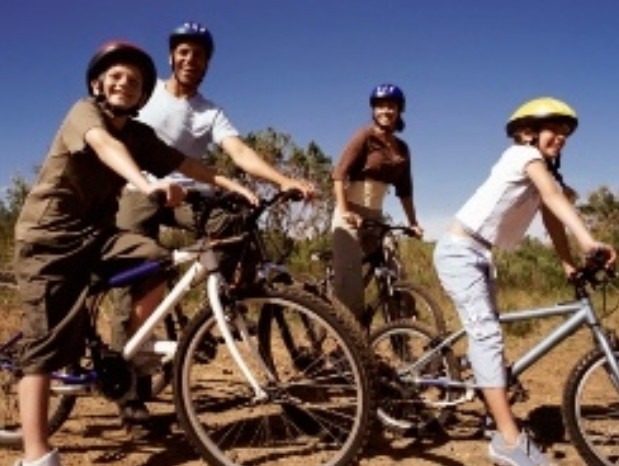 On your next family vacation to Hilton Head Island we recommend you check out our adult and kid bike rentals in Hilton Head. Find something you’re comfortable with and rent it for the duration of your stay. Every day, set aside some time to go riding together as a family but only after discussing the rules of the road first. When heading out for a ride with your family be sure an adult is in front leading the way. If there are more than one adult riding, have a second one bringing up the rear. Helmets should be worn by all and it doesn’t hurt to be wearing brightly colored shirts or jackets as well, especially if you’ll be biking on the roads. It’s important that any vehicles around you can see you. Children’s helmets are available at $2 for one day or $6 for 4-7 days. If you have children that aren’t used to riding two wheeled bicycles or going very far, consider one of the many accommodating accessories that we also rent. An Ally Cat attaches to the back of an adult’s bike for youngsters that can maintain their balance reasonably well and can ride with their feet on the pedals. We also have Kiddie Kart’s that are pulled behind an adult’s bike. These are ideal for babies and toddlers. No matter what age your children are, chances are we have the correct accessories that will enable them to go on your family bicycling adventure. There’s no better way to explore the island of Hilton Head than on a bicycle. Too much passes you by when you’re sitting in a car with the windows rolled up. A bicycle allows you to get off the beaten path and experience the true character of the island and its inhabitants. Use a map of the island and each day, as a family, head out in a different direction to explore the communities. It’s a wonderful way to spend your next family vacation!